Neoporteria jussieui var. chorosensis (F.Ritter) A.E.Hoffm. Accepted Scientific Name: Eriosyce heinrichiana (Backeb.) Katt. Neoporteria jussieui var. chaniarensis (F.Ritter) A.E.Hoffm. Neochilenia trapichensis F.Ritter ex Backeb. Neoporteria jussieui var. trapichensis (F.Ritter) A.E.Hoffm. Eriosyce heinrichiana subs. intermedia (F.Ritter) Katt. Eriosyce heinrichiana var. intermedia (F.Ritter) Katt. Neochilenia setosiflora var. intermedia (F.Ritter) Backeb. Neoporteria jussieui var. setosiflora (F.Ritter) A.E.Hoffm. Eriosyce heinrichiana var. simulans (F.Ritter) Katt. 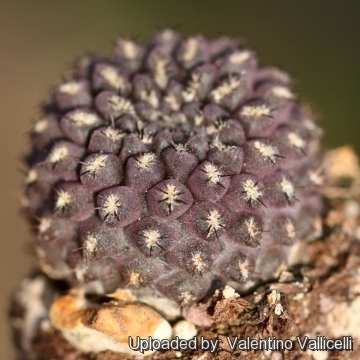 Description: Eriosyce heinrichiana f. chorosensis|SN|16108]], also known by the old scientific name Pyrrhocactus chorosensis, is a local or morphological form of the variable Eriosyce heinrichiana characterized by large open red flowers on a small dark body. Plant of this taxon are mostly spineless, but may be spiny too, and shows a certain degree of variability depending on origin. The otherwise similar features of “heinrichina” and “chorosensis”, namely size and form of stems, spines, flowers, fruit, etc., prove, that is impossible to differentiate between these taxa. Habit: It is a tiny geophytic cactus rising barely above ground level, usually solitary or sometime branching. Roots: Fibrous, arising from a large taproot which is narrowed into a necks where joining the stems. Stem: 4-10 cm in diameter, hemispherical to spherical, flattened at the apex, but often elongate in cultivation, dull olive-green, brownish to blackish green often with purple sheen. Ribs: 14-22, noticeably tubercled with pronounced chin-like protrusions. Spines: Mostly absent, or (if present) 1 to 14, stiff, needle-like, variable from very short (less than 3 mm long) to 15 mm long (depending on individuals), straight or more or less curved and not easily distinguished as centrals or radials, creamy white, brown or black and darker at the tips, turning grey as they ages. Central spines (if present) 1-4, slightly stronger 3-15 mm long. Flowers: Diurnal, 3-5 cm long and broad, closely packed apically from young areoles, funnel-form, the colour is reddish often with red/brownish midveins. Pericarpel and floral tube with bracts, wool and sparsely bristly. Fruits: Oval, to 1,5 cm long, red, fleshy, thin walled and splitting open at maturity by basal pores. Eriosyce heinrichiana (Backeb.) Katt. : Stem dark brownish, round barely above ground level (rarely elongate). Flowers creamy yellow to reddish. Distribution: from south of Huasco to El Tofo. Eriosyce heinrichiana subs. intermedia (F.Ritter) Katt. : comprises two varieties. v. intermedia has stems occasionally elongate. Distribution: Elqui Valley. v. setosiflora does not have elongate stems. Distribution: coastal areas of the Elqui and Limari Valleys. Eriosyce heinrichiana var. setosiflora (F.Ritter) Katt. : (ssp. intermedia var. setosiflora) stems never elongate . Distribution: coastal areas of the Elqui and Limari Valleys. Eriosyce heinrichiana var. simulans (F.Ritter) Katt. : often has elongate stems with long white wool covering the stem tips. Distribution: lower Choros Valley. Pyrrhocactus deherdtianus (Backeb.) Katt. : is a compact slow growing forms with dark maroon/mauve stems and fewer tuberculate ribs. Distribution: El Trapiche and adjacent ares. Pyrrhocactus dimorphus F.Ritter: has two distinct stem forms, the juvenile form whit only minuscule radial spines, and the adult plant with long radial and central spines. Distribution: Chile (Coquimbo). 6) Faundez, L., Guerrero, P., Saldivia, P. & Walter, H.E. 2013. Eriosyce heinrichiana. In: IUCN 2013. "IUCN Red List of Threatened Species." Version 2013.2. <www.iucnredlist.org>. Downloaded on 15 January 2014. 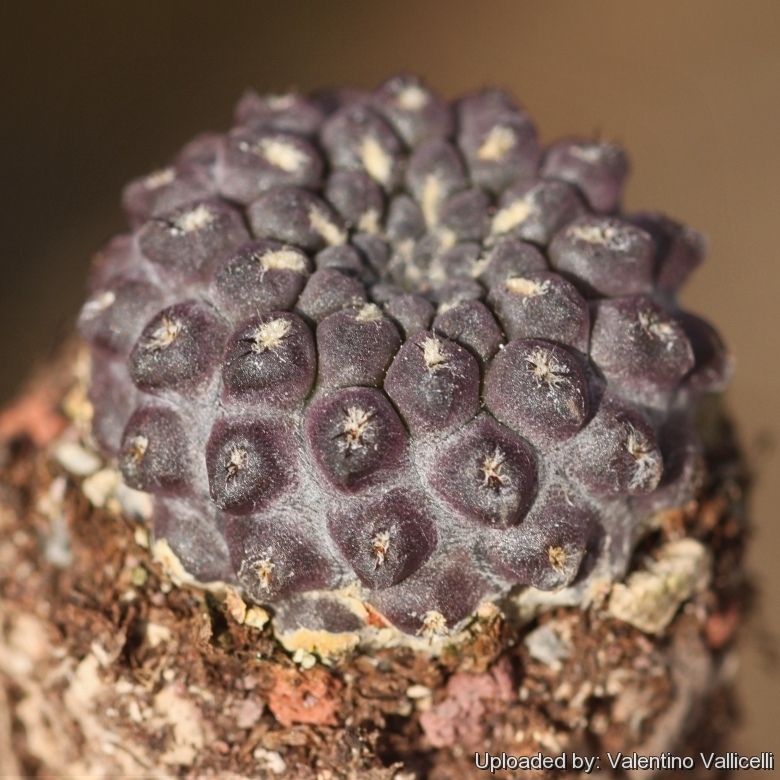 Cultivation and Propagation: Eriosyce heinrichiana is a slow growing but relatively easy to grow species, providing they are kept dry during autumn and winter and rot prone if kept in a non ventilated place.